Phew! Talk about pressure. Writing a blog post about how to write a perfect blog post is the most meta of burdens. It’s a bit different than writing about perfect tweets or ideal Facebook posts. 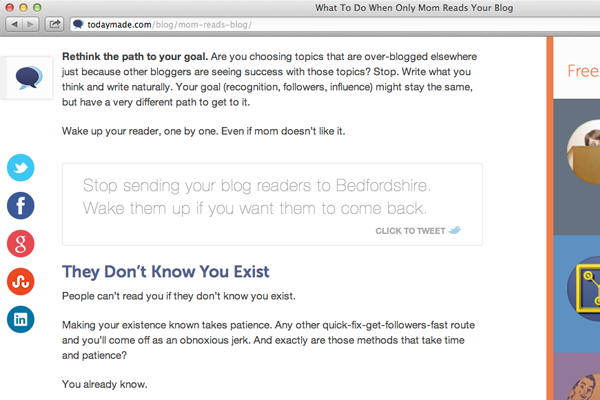 There’s nowhere to hide when you’re blogging about perfect blogging. So I hope you’ll still trust the advice here even if you don’t find this post itself to be flawless. I’m sure we’d all love for each of our blog posts to be absolute perfection—however it is that you measure perfection—so I researched all the necessary info to get us started on the path to perfection. I’ll cover headlines and length and visuals and so much more below. How close are you to creating the perfect post already? I can often get wrapped up in making sure that every little detail of a blog post is perfect. No doubt I could list way more than seven elements from perfect blog posts, but these seven seem to cover all the most important bases. Eight out of 10 people will read your headline. Two out of 10 will read the rest of what you wrote. Stats like this 80/20 rule from Copyblogger illuminate the fact that headlines are often the make-or-break moment for each and every blog post. So how do you make a headline great? 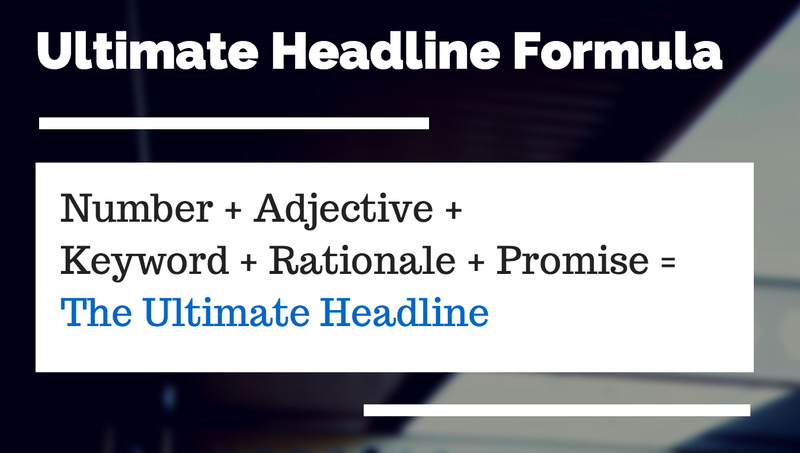 Readers tend to absorb the first three words of a headline and the last three words. These numbers via KISSmetrics come straight from usability research, revealing that we don’t just scan body copy—we scan headlines, too. Of course, few headlines will be six words long in total. In those cases, it’s important to make the first three words and the last three words stand out as much as possible. Here’s a sample of headlines from 99U with the absorbable six words highlighted. In terms of SEO, the headline (or title tag) will need to be around 55 characters or fewer in order to fit the entire title on a search results page and avoided being abbreviated with an ellipse. Beyond those specific numbers, there is extensive advice on the techniques for writing a great headline. And I do mean extensive. At last check, there were 56 million results in a Google search for “how to write a great headline.” We enjoy pairing the workflow of headline writing with the science of human psychology. With that in mind, here are eight headline strategies that are backed by psychology. There are countless other tips and tricks for writing good headlines (some of my favorites are at Copyblogger). You might even feel paralysis by analysis. Keep up on the latest headline research. Make a good effort on your headline. Analyze and improve. Ninety percent of good writing is obsessing over the perfect headline. The headline entices readers to clickthrough. The intro hooks readers into continuing. 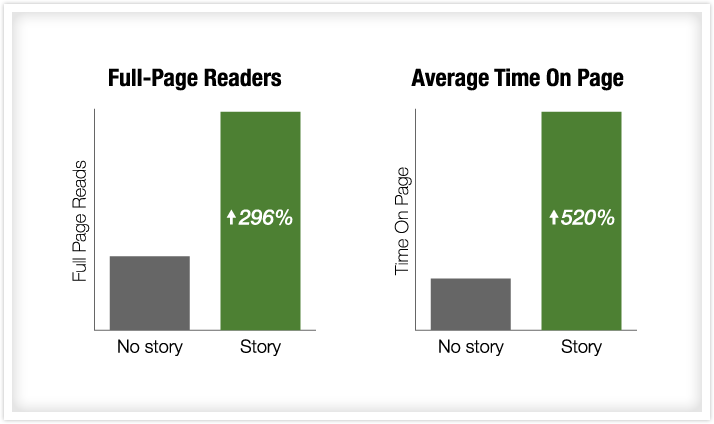 When Alex Turnbull and the Groove HQ team tested the best way to introduce a new post, they found that storytelling led to 300 percent more readers than a post without storytelling. Not only were these folks reading the post, they were scrolling all the way to the bottom and spending a much greater amount of time on the page—520 percent more, to be exact. We aim for an element of storytelling in each of the posts we write, often starting a blog post with a personal anecdote or moment of transparency. Here’s an excerpt from our content style guide as to why this aspect of storytelling is so vital. Have you noticed that every blog post on the Buffer blog starts with an image in the right-hand corner? If you guessed “because visual content rocks,” you’re right. Visuals are hugely important, and it helps to draw attention with a catchy image up top. There’s another reason for the image, too. Characters per line. Placing an image at the top right/left of your blog post forces the first few lines of the post to shorten in width. This shortening leads to fewer characters per line. Fewer characters per line has a psychological effect on the way we view content: The fewer the characters, the easier the text is to comprehend and the less complex it seems. His blueprint for a perfect blog post always includes an image to the right. If you’re opposed to a featured image, there’s another way of achieving fewer characters per line. You can boost the font size of your opening paragraph. Popular sites like Smashing Magazine do this to great effect. If you’re comfortable with code, there’s a neat CSS trick you can do to make this happen on your own blog. Add this to your CSS file, replacing the font size with the actual size you’d like to see. Perhaps you’ve heard that people don’t read on the Internet, they scan. It’s not true for everyone, but it’s true for a large enough majority that setting up your content to be scannable is an absolutely essential element of a perfect blog post. Basically, these tags are signifying a content’s importance both to the reader and to search engines. The most important line on the page is the headline, so it gets H1. The next most important are the subheadings. In this way, the post lays out quite similar to outline form. 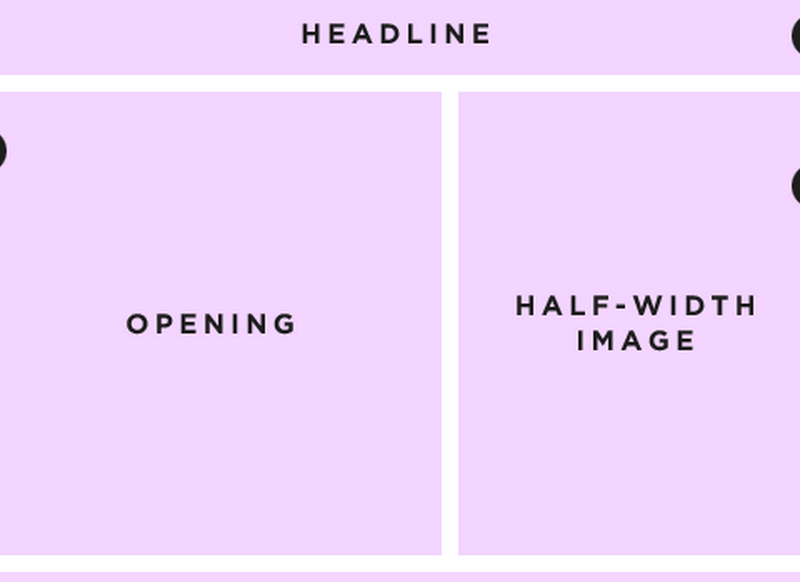 We use H1 headings for our headlines and H2 and H3 headings for the subheads inside each story. I even go an extra step to bold the subheads to make them really stand out. If you’ve written a great headline that gets people interested, included an awesome hook to get them going on the article, and formatted and guided the reader into the depths of your content, you’re better off than most articles on the Web. Now what to do about the content? Typically there are two different discussions with content when it comes to the perfect blog post. I’ll start off by saying this: The perfect blog post does not have a set length. It has some pretty good guidelines, though. If you throw out outliers like Seth Godin’s amazing 200-word posts (that work because he is Seth Godin,) you’ll find that a large number of posts perform best when they reach a certain threshold of words. 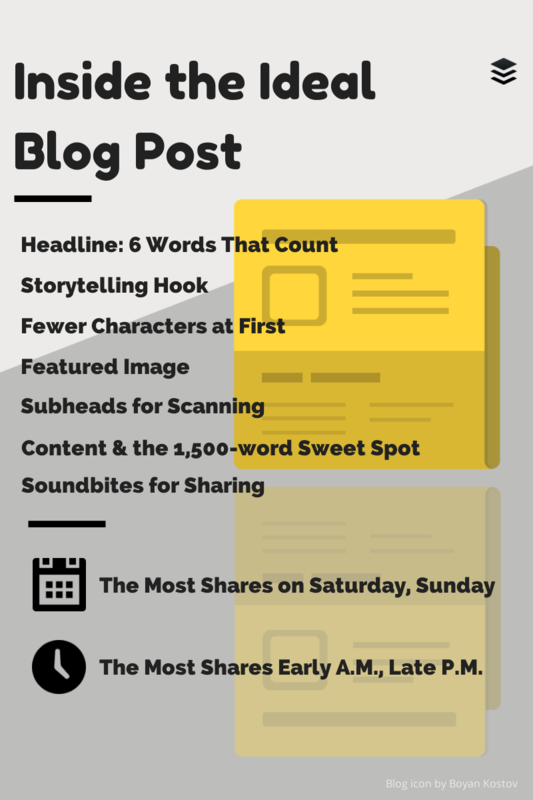 Blog posts of 1,500 words or more tend to receive more shares. Quick Sprout has some interesting data behind this recommendation. They cite research from a popular online journal that tested the Twitter, Facebook, and LinkedIn shares of all its post, broken down by word count. The longer the post, the more shares the post got. Quick Sprout’s own data supports this. Posts on Quick Sprout that are longer than 1,500 words receive 68 percent more tweets and 22 percent more Facebook likes. 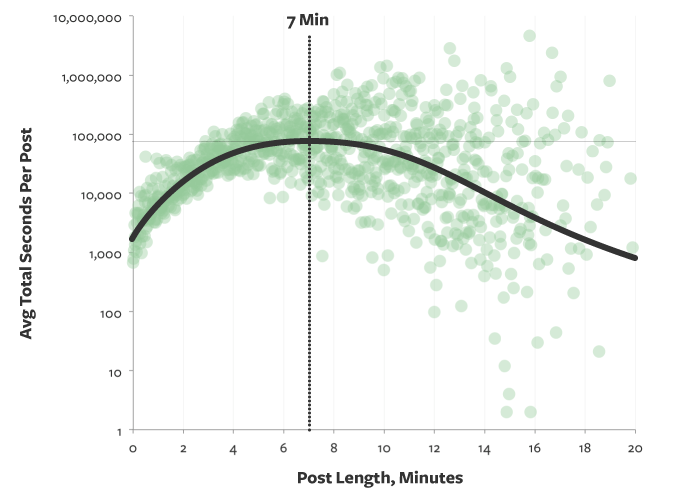 And to throw one more bit of data into the mix, our discussion on the ideal length of a blog post led to the recommendation of a seven-minute read, which equates to about 1,600 words. Here’s the engagement graph from Medium that supports the seven-minute claim. Of course, with longer content comes the necessity to make it as scannable as possible. The Nielsen Norman Group found that people only read 28 percent of the words in a blog post. Subheads (as mentioned above) are a great way of making your post scannable so readers can find the content they want. 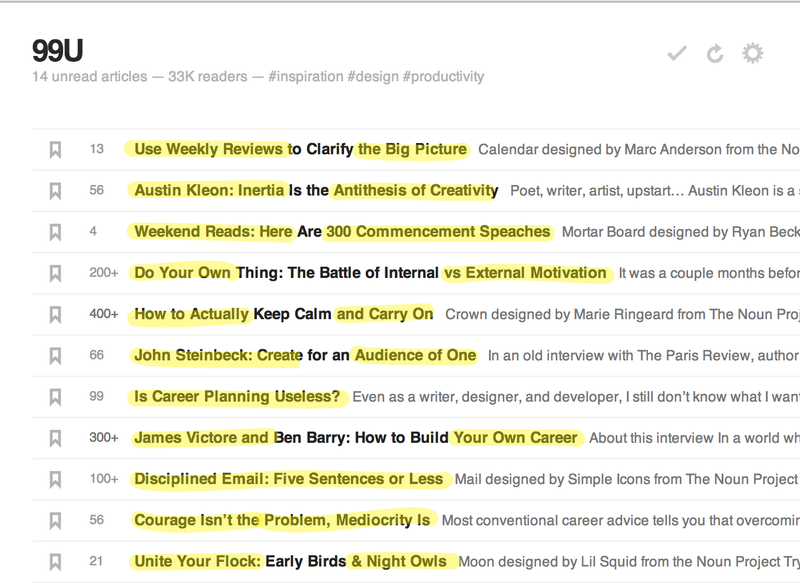 Here are a few more tricks that we’ve used on the Buffer blog. If you’re looking for off-the-radar advice on the perfect blog post, I think you’ll enjoy this gem from Derek Halpern: People love to share quotes on social media. Make your perfect blog post as quotable and shareable as possible. Halpern calls these soundbites “tweetables” because they tend to get great virality on Twitter. He cites a fellow blogger who tried out the method and saw 800 clicks on the tweetable quote. To make a soundbite or tweetable, pull the best bits from the content you’ve written and include a “Tweet This” or “Share This” link alongside the text. Make the text stand out so that readers (i.e., scanners) can quickly see your most notable and shareable words and so they can easily click to share. There are some neat WordPress plugins that can help you here, as well as some online tools. Click to Tweet website – The website tool lets you build a tweet to include in any post, and your work gets saved on their site to edit or track clicks after the fact. The above items are the big ones. To create a perfect blog post as quickly as possible, focus on those. If you’ve got a spare moment or two to refine even further, here are a few areas you could try. We aim for calls to action in a number of places on our blog—the sidebar, the header, and the footer get our most prominent CTAs and the text itself has a handful of internal links sprinkled throughout. Links are a standard part to the majority of successful blog posts out there. Blog Pros’ study of 100 high-ranking blog posts noticed that these posts averaged nearly 10 links inside each story. Some of the smaller posts had incredibly high link-per-word ratios, owing to the fact that they were essentially tables of contents for other resources. Eight posts lacked links in the content of the blog, though they often included a final sentence call to action or related content widget. We remember photos 6 times easier than text. So not only will people enjoy reading your blog more if you include beautiful photos, they’re more likely to remember it too. The results from the Blog Pros study shown above support the visual content emphasis. The 100 popular blog posts averaged one visual image for every 350 words. Perfect blog posts will need to be shared, right? It’s best to make it as easy as possible for readers to share your great posts, and you can do so by including share buttons in the header, footer, or sidebar of your content. We do this a couple of different way on our Buffer blogs. The Digg Digg WordPress plugin displays share buttons in a floating panel to the left of the content on our culture blog. The share buttons appear at the bottom of our content here on the marketing blog. Creating a good link for your story might be the last thing on your mind when building the perfect blog post. Here’s some advice from Daniel Zeevi of Dashburst that might change that. Google has revealed that it is best to use three to five words in the slug of your permalink. Additional words will be weighed less and could even appear spammy. So keep your permalinks short and take care to place important keywords first! While keeping in mind the search engines, also keep in mind us humans. Be descriptive with your URL so that someone who sees the link can know what they can expect to see if they click. 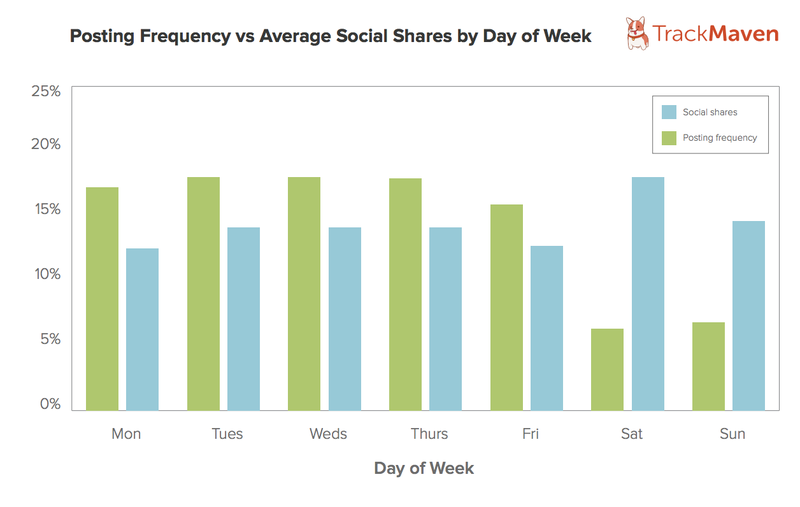 Blog posts get more shares on Saturday and Sunday than any other day of the week. Why might this be? The Late-night Infomercial Effect might come into play here. Essentially, when there’s less competition, the more your post stands out. When nothing is on late at night, infomercials get their most play, and a similar comparison could be made to content posted on the weekends. Perhaps boost some promotion on the weekends or even consider posting original content that doesn’t have to compete with so much other content (only 13 percent of the 1.2 million blog posts in the Track Maven study were published on the weekends). 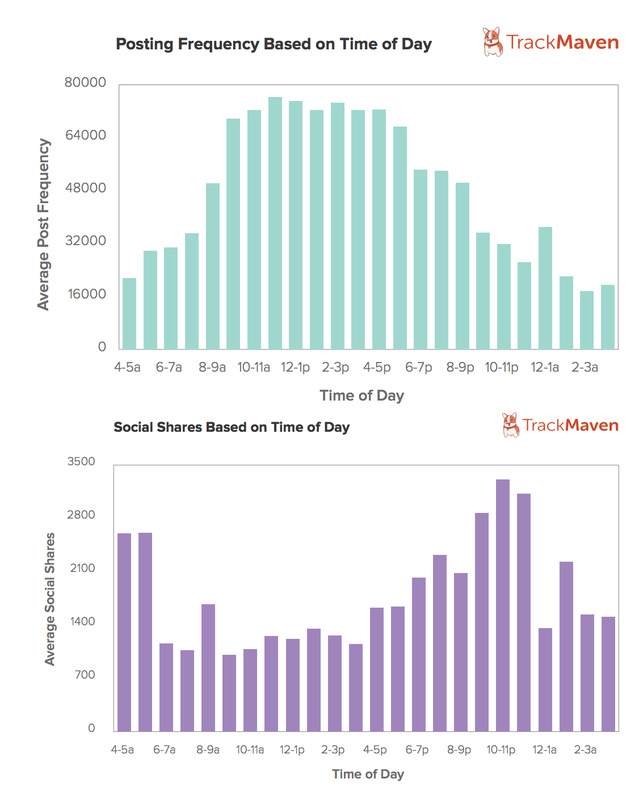 Below, the two charts show when during the day blog posts are published (the green chart) and when during the day the most social shares happen (the purple chart). Shares tend to spike early in the morning and again late at night, with steady, lower sharing throughout the day. There could be a bit of Late-Night Infomercial Effect here, too. Either way, there are certain times of day when sharing is at its highest, and it might make sense to schedule some social media posts around those times. I hope you found these blog post tips helpful. I know I couldn’t help but think of them as I was writing this post itself. Now it’s your turn to go put these tips into practice! I’ll leave you with one more bit of advice before you go. 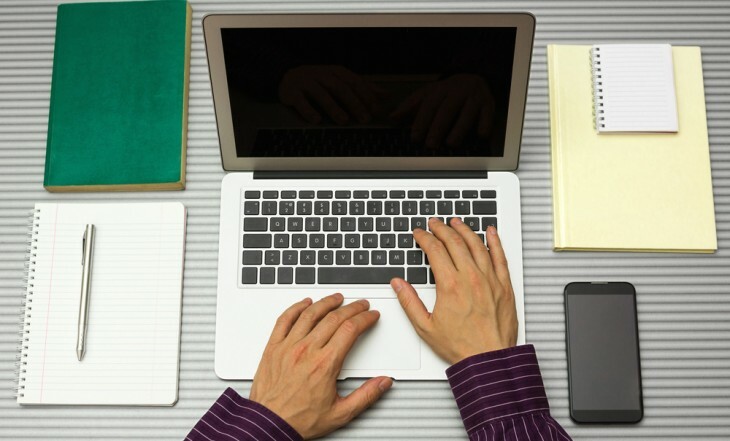 Hubspot has a superb list of traits that great blog posts should include. Here’s the brief rundown, and you can read more about each over at Hubspot. How many of those elements can you work into your next blog post? What tactics from our list of perfect ingredients will you be trying out? I’d love to hear what you’re thinking and what you’ve found to be best for you and your blog.